Oneida, TN (2018-09-10) A Scott County woman that was allegedly prohibited from being at an Oneida residence was reportedly found inside the house holding the court order barring her from the property. Donna S. Brewster, 35, of Oneida was arrested by the Oneida Police Department last week after she was found inside a house on Hunter Street in Oneida. According to an arrest warrant filed by K-9 Officer Toby Jeffers, Brewster had been barred from the residence by court order in April. Authorities say that Brewster was holding the no trespass order when she was arrested. 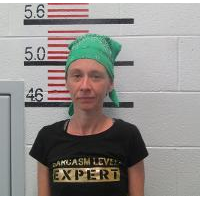 Brewster reportedly told authorities she knew she wasn’t supposed to be there and knew she had to go to jail. Brewster was booked for criminal trespass.